Traveling cat spotted in Battle Ground, Washington, USA. This cat is called Aurora and she belongs to author Marilyn Connor Miles. "Aurora is an indoor cat, but she loves to go out on a leash," Marilyn Connor Miles says. "We live in the country and there are too many predators around here, including coyotes, owls, hawks and sometimes bears and cougars!" 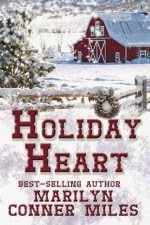 Marilyn Connor Miles' latest novel is called HOLIDAY HEART. It's a Christmas story about a lonely woman who bumps into her ex-boyfriend on a wedding. It's been six years since they broke up and she hasn't seen or heard from him since. How will she handle seeing him again, especially if he has another woman on his arm? Love the pink leash. Have a fabulous Friday. Aurora is adorable! I always think cats look so cute on leashes. Mine would kill me before he'd allow it LOL. Thank you! I didn't think she would either. Must have been desperate to go out. Now she jumps up on the hamper in the laundry room and waits for us to put it on her. Not sure if the problem is on my end, or yours, but I thought I would let you know. I'll try again in a bit. I got some of them done though. Gosh, I 'm sorry you're having problems. I'll look into it. Love your dog! We had out Husky for 12 years and miss her every day. Aurora sure is a beautiful one! Thank you! She doesn't seem to know it either. However, she is a finicky princess! She is and its never enough for her. She lets me know every day that its TIME TO GO OUT!!! Thank you. Sorry I didn't see this until today. Next week? I entered and love a great romance story! She has a gorgeous cat, too! Thank you for entering! My upcoming release that follows Holiday Heart, is about a mini-farm with all kinds of animals and their caretaker who knows nothing about them! It was fun to write. Aurora thanks you for your kind words. I love the pink leash too. Thank you! I wish it matched the neon pink collar a little better! But its long and that's what counts! Love the photo and the book sounds great! Aurora semble apprécier ses balades. Et comme ça au moins il n'y a pas de danger. C'est effrayant d'avoir des chats qui vont dehors lorsqu'il y a des prédateurs dehors. Je suis heureuse que ma forêt ne soit peuplée que de petites bêtes et de chevreuils. I'm sorry I don't read French, but thank you for your comments. Aurora is beautiful. I love the harness. Your book sounds wonderful. I can't wait to read it. Is that a Snowshoe kitty? If so, I just love them! Yes! Like the Grumpy Cat! Aurora is beautiful! 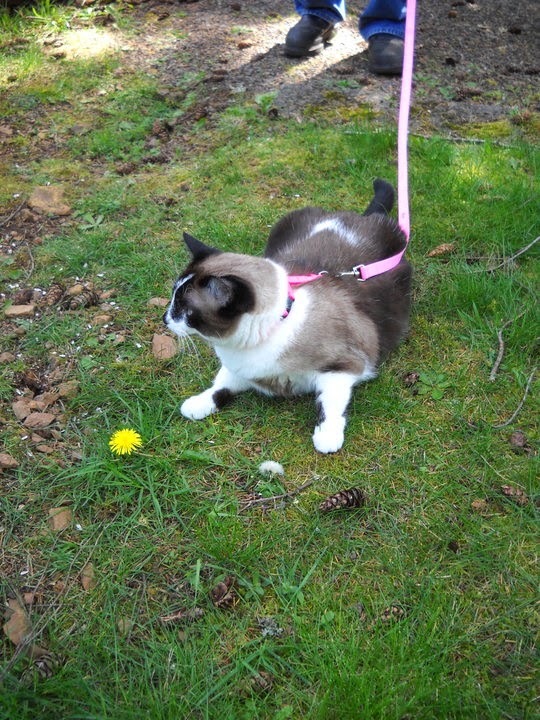 We are all inside kitties here too, but Sophie loves going on on her leash. The rest of us don't care for it. Good luck to everyone entering the giveaway! Wow, I can't imagine either of my cats being patient enough for a leash! She's just an all-around unusual cat. I've had a Siamese and a tuxedo cat (basically a Siamese) but Snowshoes seem to be unique. None of my previous cats tolerated a leash either. Even Aurora won't tolerate it in the house. When we come in, she wants it OFF! Aurora is a princess ! Whoa looks like fun there in Battle Ground Aurora. Yes it is, Timmy. However, its raining today and I'm staying indoors! how gorgeous. i had an indoor kitty too. shes to cute for words. and yes she needs protection for those predators. cheers!! I really like content of this blog, I just loving it.